When I arrived to care for my toddler granddaughter a month ago, I was presented with this bucket. It bears a butterfly made with her footprints. “I will put it in my office,” I said, immediately wondering what kind of plant I could put in it once I returned home. Meantime, I placed it on the dresser in my room, and it occurred to me that it was the perfect place to hold my pill bottles. Up and away from curious little fingers. I’ve reached a point in my life where I don’t have to worry about where I place my pills. Though they each have a certain “home” in my house, it mattered not where they went. Now, I have to be conscious about the whereabouts of my concoctions. What’s in the bucket? Prednisone, my frenemy, 2.5 mg once a day. I’d weaned off, but after a week my hands were hurting so bad I had to cave and go back on it for the duration. When I was young and raising my children, I had no idea the workout my hands took. Now every twinge reminds me that caring for a toddler is manual labor. Though with great and bountiful rewards. There are days where my hands still hurt, like today, and my wrists as well. Foreseeing that, I packed a wrist brace, which I’ve had to use several times. I wear it at night and in the morning the pain is gone or diminished. Perhaps it’s mind over matter, a placebo effect, but I’m not questioning its efficacy. 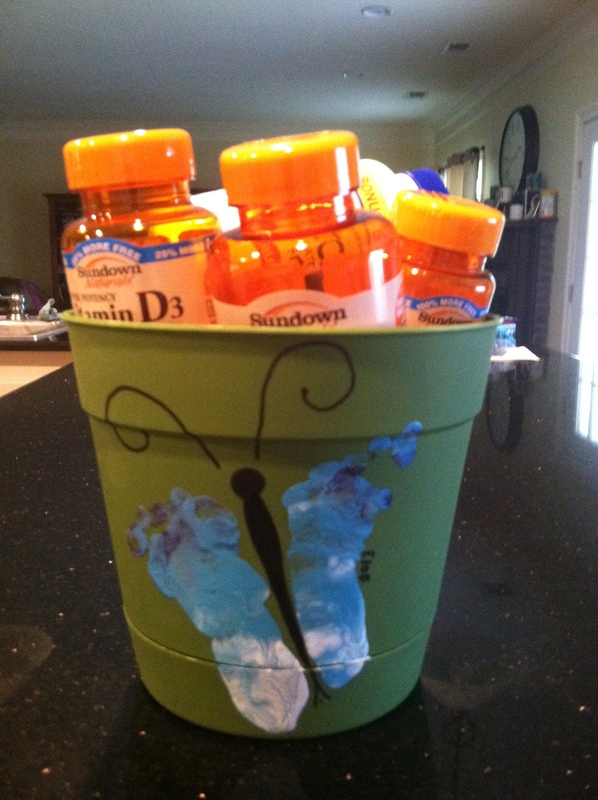 Also in the bucket is Folic Acid, the rescue drug for Methotrexate. Nuff said. I take MTX on Wednesdays so it doesn’t rate a place inside the bucket. There’s my eye vitamins, prescribed by my ophthalmologist. They contain Vitamin C, Vitamin E, Zinc Oxide, Copper, Lutein and Zeaxanthin. I’m supposed to take them twice a day, but usually take it once. They are mostly prophylactic. My “apple” a day, you might say. Or maybe, the apple of my eye. There’s Vitamins B1, B6 and B12, prescribed by my PCP to treat shingles pain. It is now almost 14 months since I had shingles, but the pain is not completely gone. On a scale of 1 to 10, it is a one, sometimes a two. It depends on how that part of me is affected by my activities. But it took its sweet time climbing down that ladder. I was scared to death worried it would be a 10+ forever. Also in the bucket is acetaminophen (the ingredient in Tylenol). Since Naproxen and/or Plaquenil gave me tinnitus I have to stay off NSAIDS (non-steroidal anti-inflammatory drugs). So, hello, acetaminophen, which I take once or twice a day. Some days none at all. The good days. The tinnitus is practically gone. I only hear it when I concentrate on it. And I don’t have much time to concentrate on it right now. And of course, Vitamin D3 and calcium supplements, which also contain D3. I’ve been on Vitamin D since 2006 and I give it much credit for my turnaround that began in 2009. I know it was a mix of things that allowed me to rise to the surface and breathe again, but Vitamin D was a major factor. I take 2000 IU’s a day. Each calcium tab gives me another 500 IU’s, so I end up with 3000 on most days. 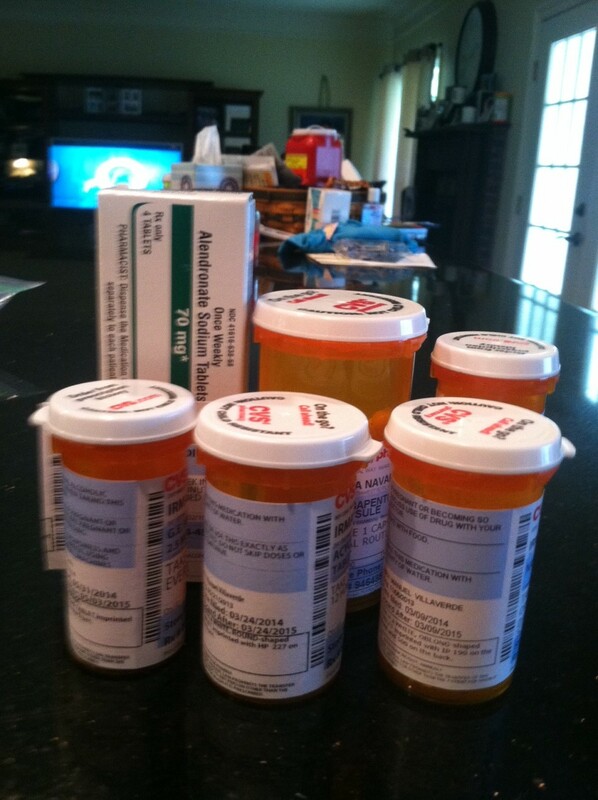 It would be nice to say that is the extent of my personal pharmacy, but no. and most important of all, cyclobenzaprine (generic for Flexeril, a muscle relaxer). My rheumy prescribes it for sleep. And we know if we don’t sleep, our pain is that much worse. I take 5 mg nightly and when it’s been a painful day I take ten. No longer in the bucket, its empty husk having joined the inhabitants of Baggie World, is Acyclovir, the antiviral my rheumatologist ordered for a year to prevent a shingles recurrence, Lord forbid. I ran out a few days ago, but I’ve crossed the year mark and now I cross my fingers. We shall see what, if anything, develops. This entry was posted in Uncategorized and tagged Chronic Disease, Family, Hand pain, Life, Love, Resilience, Wrist pain on June 3, 2014 by Irma.